President Muhammadu Buhari has expressed satisfaction with the preparations made by the Independent National Electoral Commission (INEC) for the forthcoming general elections. The president made his feelings known when he met with members of the European Union Observer Mission (EOM) to Nigeria’s elections starting in February. The President also told the EOM, led by the Chief Observer and member of the European Parliament, Maria Arena, that he was optimistic that the electoral body would deliver on its mandate of a credible poll. Buhari said he had listened earlier in the day to the INEC Chairman, Prof. Mahmood Yakubu, when he briefed the National Council of State. 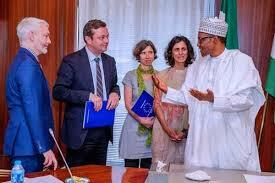 Buhari told the EU delegation that Nigeria had grown its electoral system incrementally, getting better year after year. He stressed that the ruling All Progressives Congress (APC) administration had the good sense of identifying the national interest to include security, peace and stability, improved economy, jobs creation and the campaign against corruption. He noted that the party was not wrong in 2015 and is not wrong going into the election this year with the same issues in its campaigns. Buhari thanked the delegation for taking interest in Nigeria’s elections and in the affairs of the nation generally. The EOM team, accompanied by Amb. Ketil Karlsen, Head, European Delegation to Nigeria and ECOWAS, said that the EU had observed every election in Nigeria since 1999 and had come here again for the next one, following an invitation by INEC.